When you go into a city, you can leave again by pressing Cast off on the left. 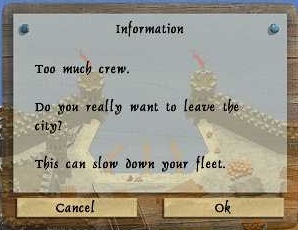 If you get an information box telling you that you have too much crew. You should really not ignore it, as if to much more crew, than what you really can have, it can sink your fleet. You can dismiss some crew by pressing town then pub. 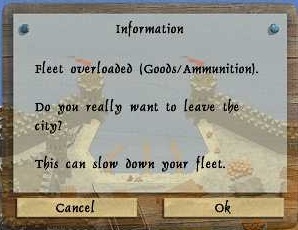 You can also get an information box telling you fleet overloaded, here you should also not leave port, as it also can sink your fleet. You can press town to leave cannons and ammunition in the shipyard and goods at the merchant. To see what exact you have to much of, look at the status bar at the bottom of the screen, here you will see red numbers at the things you got too much of. Learn all about the status bar here. 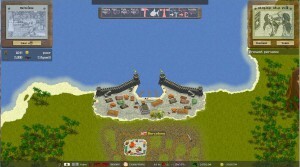 To the right you have two options you can use, called harbour and town. You can also see if other players are in the port, their name will show up under present persons to the right.